The July 2017 State of Oregon Economic Indexes was released today. Full report is available here. We thank KeyBank for their generous support of this project. 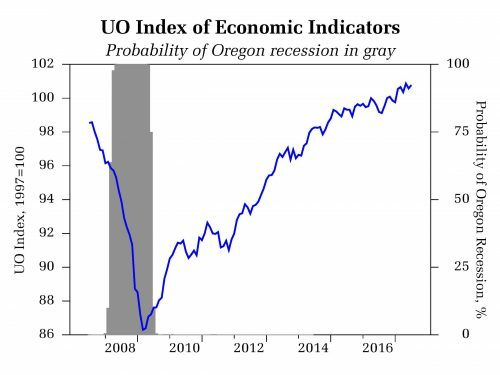 The Oregon Measure of Economic Activity stood at 1.52 in July, up slightly from a downwardly revised 1.49 the previous month. The three-month moving average was a solid 1.31 (“zero” indicates average growth over the 1990-present period). Manufacturing strength continued to fuel the measure; an uptick in average weekly hours worked in the sector made a large positive contribution. Employment supported the construction sector while housing permits made an effectively neutral contribution. 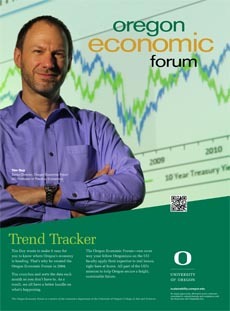 The University of Oregon Index of Economic Indicators edged back up in July, continuing to track sideways consistent with behavior experienced in a mature stage of the business cycle. Like last month indicators were relatively unchanged. Manufacturing indicators – average weekly hours worked and core new orders in the sector – are tracking stronger. This is further evidence that the slowdown that weighed on the sector last year has eased. Similarly, the Oregon weight distance tax, a measure of trucking activity, rose during the month.